I listened to Meghan McCain’s eulogy for her father on my drive over to visit dad today and cried the entire way. What an incredible eulogy! It got me thinking how lucky John McCain was both in how he chose to live his life after enduring such tragedy in the Vietnam War, but also how he chose to and was able to live his last days. He could have come home from his POW experience and had it eat him up inside with anger and revenge, but instead, he channeled it towards helping to make the world a better place for all of us. Now, I don’t agree with everything McCain stood for but I definitely came to appreciate his forthrightness and his ability to acknowledge when he was wrong. I, like the Senator, stand up when I see something wrong and do not worry about what others think. I am, like McCain, a direct communicator. I am proud of that as much as I am frustrated by it when others do not communicate with me as directly as I would like them to. Senator McCain was so lucky because he got advance notice that his days were ending so he could choose how he wanted to live out his last days. My mother was not so lucky, succumbing to a heart attack in her sleep at the young age of 57. The Senator was able to spend time with all who meant something to him so that he could communicate his love for them as well as how he wished to be remembered. He could communicate his wish for how he envisioned his funeral. He could communicate a strong call to arms for the nation to stand up to fascism and tribalism that is enveloping his beloved nation. In short, he could communicate. Throughout our lives, we learn from our parents and I hope that I am always teaching my children, despite them not really being children anymore. Although my father is no longer really able to express his needs or really communicate anything clearly to me anymore, I am still learning from him. My father continues to show everyone he meets that he has a sense of humor about the world and that he accepts what is because he cannot change it. As a result, he doesn’t fight having people help him. He accepts all help with grace and gratitude. He is old. There is no denying that. At the ripe old age of 91, he has outlived his entire family. He is the last living relic of his generation. Yet, he is okay with that. Even grateful. Whenever I say goodbye after a visit and I say “I’ll see ya later,” he always responds with “I hope so.” He doesn’t take anything for granted. I know he hates bingo and some of the activities they offer in his facility but he participates anyway because, why not? How to Live The Last Chapter of Your Life With Dignity. He never complains. He generally is happy. And he appreciates all the help he is given. He loves getting attention, but doesn’t demand it and is grateful when he gets it. He continues to smile and treat people with respect, just as he has always done. Despite his body being riddled with Parkinson’s and despite the difficulty he has in getting out of a chair, he continues to be willing to get up and take a walk (assisted) daily. I can tell it isn’t enjoyable for him, but he continues to do it because he knows that once he stops, he will lose the ability to walk. So he keeps at it. In a memory care unit, music is playing much of the time because the brain never loses the ability to retain a song. He will often start singing along with a tune that he hears. It’s wonderful because it is often one of the few times I hear a coherent sentence come out of his mouth. I hope that the example I am giving my own children will resonate with them. I hope they will understand the importance of taking care of family, no matter what happens, no matter the inconvenience. I hope they will understand that it is a privilate that I am able to do this for my father. Sharing these last few years with him, although a huge disruption to my life, will be something I will cherish the rest of my days. Sometimes it amazes me (no pun intended) how I stumble on this information. I shouldn’t have to stumble. This information should be readily available and it’s not. I hope that, through this blog, you will pause and ask questions when you encounter a situation so you can learn about your loved one’s Medicare benefits in a more expedient manner than I have. My dad was on Medicare Part A last fall after he came back from rehab after his hip surgery. He was getting physical therapy and nursing services for wound care. When he went into the hospital this last time, I learned about a specialized Physical Therapy practice that had particular expertise in Parkinson’s so I made a note to myself that when he came home, I would sign him up for their services. What I learned was that because they came into the facility, they fell under “Home Healthcare Services” according to Medicare, which falls under Part B. You cannot access Part B services at the same time as Part A services. So I had him discharged from Part A because I really wanted to try out Dynamic Home Therapy, the specialized therapy provider. I was not disappointed. They provided superb therapy, both physical and occupational therapy services and went even further to suggest that he look into a different wheelchair. I was exceedingly pleased I had made that decision. 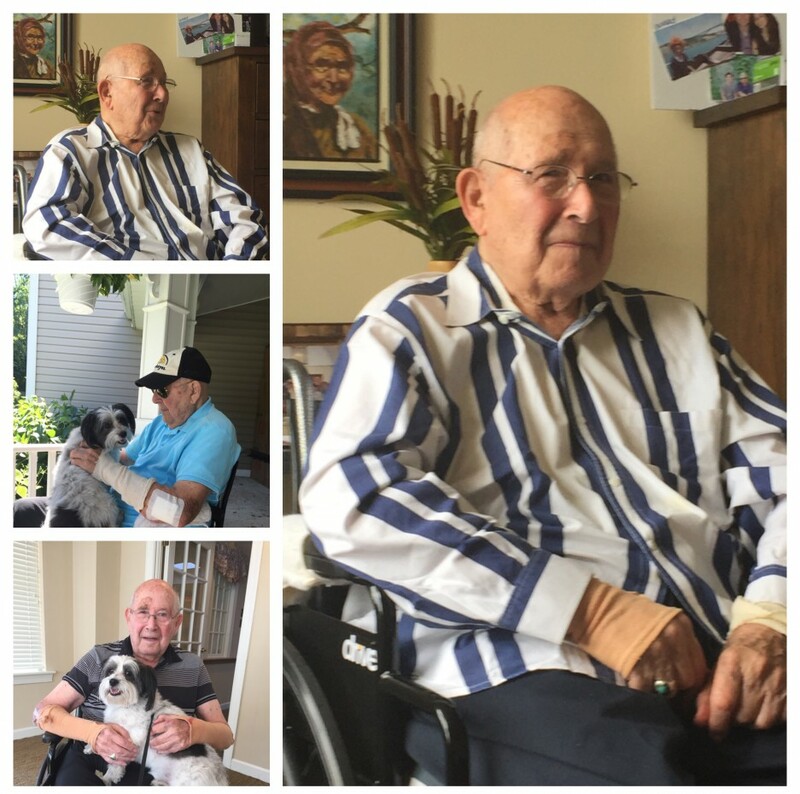 Once he was discharged from Dynamic Home Therapy, I figured I would eventually move him back onto Part A for skilled nursing services as he always seems to have a skin tear that requires nursing services. Last week, I finally got the paperwork together and today, the nurse stopped by to tell me that she would be starting next week and would be providing him with wound care. And this is the KEY THING SHE SAID: She casually mentioned that when she opens a new “incident report” it comes automatically with 20 sessions of Physical Therapy! There is no dollar limit like there is with Part B but there is a 20 session limit PER INCIDENT. She can re-certify him every time there is a new incident and, in my dad’s case, simply having Parkinson’s would qualify him to stay on because there is no longer a need to show improvement. And, he pretty much always has some sort of skin tear so nursing would always be able to re-certify him for that. This means he will have ongoing physical therapy. There is an in-house therapy team right where he lives which is convenient. It’s not the specialized therapy that Dynamic Home Therapy provided me, but I look at it as a way for him to continue to get structured one-on-one exercise 3 times a week, compliments of Medicare Part A. Your welcome for the information. The average length of time that a caregiver takes care of a loved one is 7-8 years. Most caregivers go into this experience thinking it will be for 2 years. This is more like a marathon, not a sprint. I began taking care of my dad remotely about 3 years before I finally moved him out East. Most caregivers, including me, set off down the path of caregiving without much thought. Of course, I will take care of my dad. He was a wonderful father and gave so much to me and to his community. He deserves nothing but the best. Without thinking about the long-term consequences of that decision, I moved him out East to be closer to me…and assumably to be closer to his two sons and his niece and nephew who are up in the Boston area. Surely being closer to all of us would be a good thing. He would get to see them more often because they aren’t as far away. I knew that I would be doing the lion’s share of overseeing his care because I am the only one local, but I also assumed that my siblings would pitch in and help with this monumental job of taking care of our father. One of my brothers set up a secret facebook group which allows me to privately post status updates on how dad is doing, to post videos of him, keeping all of them in the loop on how dad is doing. I regularly update it and it is a better way of communicating with so many interested parties than to be bombarded with phone calls wondering how he is doing. I believe this facebook group has enabled my two siblings to become complacent. They see how well dad is doing and are able to keep up to date on his progress remotely. It is further exacerbated by the fact that dad really cannot communicate on the phone anymore so they cannot call him to keep that connection alive. They really need to visit him in person. And to really see how he is doing, they need to visit for a few days, not a few hours a couple of times a year. Every day can be different with the Dementia experience. On one day dad could be pretty verbal for a short time and then be unable to communicate the rest of the day. If you pop in for a few hours, you may catch him on a good day. This is wonderful, but it doesn’t give you a true sense of the magnitude of the job of caregiving day in and day out. If you are not the direct caregiver because you live out of town, that does NOT let you off the hook of providing care for your loved one. What it means is you have to help in other ways. You should be calling the direct caregiver regularly and asking them how you can help. You should be doing things like sending notes thanking them for taking care of dad and telling them how much you appreciate it. You can be sending short notes to your father letting him know that you are thinking of him (since he cannot speak on the phone). You have no idea how much of a sacrifice this is for the direct caregiver and their family. Unable to work, the family sacrifices current income and is not able to contribute to their own future retirement. Vacations become difficult to manage because you are your loved one’s voice and their advocate. A large percentage of caregivers do not survive the person they are caring for. This is a highly stressful experience, both physically and emotionally. I have it much better than someone who is caring for their loved one in their home because my dad is in an assisted living facility. However, that facility is taking care of just his basic needs. To care for him as he deserves, there is much more to be done. I am there 6-7 days a week normally. I spend hours with him. Most of the time he cannot communicate, so I am his advocate. I make him feel connected and feel like he is communicating (even though he does not make any sense) by doing improv with him (Oh really? Tell me more!). I walk him and do stretching exercises with him. These are just the basics. Then there are all of the doctor appointments that can sometimes kill a half a day. Because of his mobility issues, I sometimes have to enlist my husband to help get him to the appointments, so now two of us have killed half a day. Figuring out the logistics of transporting a body interstate and pre-paying for his future funeral…and there is probably more that I am not thinking about. I UNDERSTAND THAT YOU HAVE BUSINESSES AND JOBS. I GET IT. BUT YOU ALSO HAVE A FATHER. You are missing out not only on the opportunity of spending time with him, and the rewards that come from knowing that you helped to take care of your dad after all that he gave to you. And you are also fracturing your future relationship with your sibling, the one who has shouldered most of his care. I want to be clear, one of my brothers has been generous and recently took me to see my favorite artist perform when she was in town and sent me a gift card for a massage about a year ago. My cousins have each visited a couple of times. My step brother and sister-in-law have visited a couple of times for short visits. For that I am grateful. What I need is more than that. Let me be brutally honest. I need a week off. I need a few days off now and again. Not once a year, but periodically. I need my siblings to step it up and participate in the care of our father. Last night, I attended a session on caregiving sponsored by the facility where my dad lives. The examples they gave talked about how one sibling did the majority of caregiving because they were local but the others alternated visiting every few weeks to a month to give that primary caregiver a break. A break. What a novel concept. I appreciate the fact that they came to dad’s recent 90th birthday celebration, but again, they came for 2 1/2 hours and then left to go home. That is not helping in the caregiving. This takes more than a village. It is more than a full-time job. I want my village to wake up to the reality of what is at stake. This crisis in our family can either make our sibling relationship enriched and stronger or it can tear it apart. I couldn’t resist putting this FANTASTIC photo of my dad and me and in this post. When the going gets tough…and with a progressive neurological disease, it gets tougher each day, I try to remember the good days. This was one of those. Today was one of those days that reminds me that there are great things about assisted living facilities and not-so-great things. It’s a good to always remember that it isn’t going to be the same experience as if you were taking care of your loved one. And that can be a GOOD thing because, as is the case with my dad, I couldn’t possibly handle his needs because he requires complete 100% care. He can do nothing for himself at this stage. If you are thinking about whether to place your loved one in a facility or try to cobble together aids to help your loved one stay in his/her own home, let me give you some frontline expertise. In an assisted living facility, there is a community. People need to be around others. They need to feel as if they are part of something bigger than themselves. Even if they no longer communicate or independently move about the planet, just having others in the room, having activities going on and other types of stimulation will add years to your loved one’s life. And beyond years, it will add life to those years. If you find a place, as I have with Daylesford Crossing, where the staff truly love being with the residents, it rubs off. Today I witnessed two staff people singing at the top of their lungs as they walked down the hallway. They were having fun and when the residents see that joy, it transmits to them. I have seen it in action. One day, the music was on and the woman who is in charge of keeping the rooms clean was literally dancing with her mop to a Motown tune. It was hysterical! When shopping for a facility, try to come at different times of the day and catch the staff who work the different shifts. It will give you a good feeling as to whether this is a place that people come to live…or to die. Now…the cons of living in a facility. I have to remind myself that this is not a nursing home. I specifically did not want to put my dad in a nursing home until it was absolutely necessary. So I cannot expect nursing home care in an assisted living facility. This means that I have to be more vigilant, have more of a presence so that when there is a shift…a change in his behavior, his mobility, or his cognitive abilities, it will probably be me who will see it first. Even though others may notice something unless it is a really BIG change they are not likely to mention it. Why? Because they have (in my father’s case) 18 others they are caring for and there are multiple shifts caring for these people. You’d like to think that they are attentive, but they just cannot be as attentive as you can be. So don’t assume that by placing your loved one in a facility that you are off the hook. You absolutely need to be present as much as you can so you can notice these types of changes. Don’t assume they will tell you (they might…but it might be 2 weeks later than you would have noticed). This week’s events showcased this perfectly. Beginning on Monday morning (3 days ago) I noticed a change in my dad’s abilities. He was sleeping way more than usual during the day. He had a great deal of difficulty rising from his wheelchair to walk (something he did twice a day, for exercise), really couldn’t walk at all and cognitively he was more confused. His vision even seemed worse. I chalked it up to maybe a bad night sleep. So I said nothing. I came the next day in the afternoon to see if there was any improvement. There was not. Same thing on Wednesday. I finally started asking around. It turns out the exercise physiologist who works with him to assist him on his walks was having the same difficulty as I was. Also, the several CNAs who work directly with him caring for him also noticed a change. No one said a word to me. As I collected my data, I saw enough to concern me. So I called his doc who suggested getting him assessed. We did that today and the nurse does not think it is a neurological issue; she thinks it might be as simple as a UTI (something he is prone to get). I normally can tell when he has a UTI because his behavior gets combative (not his usual personality). I wasn’t seeing that. Apparently, a UTI can show symptoms like I was seeing….so we are off to collect a sample and see what it shows. The bottom line is I went through an emotional roller coaster these last few days thinking the end was nigh because I thought he may have had a TIA (a mini-stroke) or some other neurological mishap. I still don’t know for sure, but I feel more confident that it might just be a UTI. Sometimes when you are in the daily grind of caregiving, you become numb and forget to think about preparing for the next phase. When you are dealing with a progressive disease, as my father is, each day you lose a little more of your capabilities. The changes are tiny and only if you are paying attention might you realize what is happening before your very eyes. I notice it only when I stop and reflect back, and then I see that progression. This week, I did a bit of that reflection as I was looking through photos from the last year on my computer. A year ago, my father was still at Sunrise of Paoli. He had just come off of a fall and had completed his rehab for a hip replacement. It was around this time that I realized that I needed to move him; I realized that the place he was living was really not meeting his needs. I also remember that at that time, I was able to communicate with him most of the time. Yes, he had difficulty remembering anything short term, but if I kept my sentences short enough, we could communicate. A year later, I am seeing fewer and fewer of those meaningful exchanges. His ability to communicate is almost non-existent, although he doesn’t realize it so he continues to “talk” to me and I continue to do “improv” with him. We “talk” but 95% of the time I have no idea what he is trying to say. I continue to “talk” to him as I want him to always feel he can express himself and I am hoping through my improv skills I make him feel as if he is communicating with me. He is still able to follow simple directions, which is great. However, I need to start planning for how I am going to handle the next phase of his disease. I predict that at some point he will give up trying to talk either out of frustration or because he no longer has the wind power to push his words out (another side effect of Parkinson’s is that your voice gets very very quiet). I have been testing out strategies for this next phase. And what I have found is that there is a tremendous amount that can be communicated through touch. When words fail, I often just reach out and hold his hand. It is electric. I instantly feel the love flowing freely in both directions. Sometimes I just massage his shoulders and I feel him relax and moan in glee. This weekend I bought him a massage. I found a therapist that specializes in prenatal and geriatric massage. He was in heaven. And, I’m told, he was able to verbalize his happiness to the staff all afternoon. So when the going gets tough….and it will get tougher, it is important to start thinking about that next phase. The next phase may, in fact, be more rewarding than the prior phase.